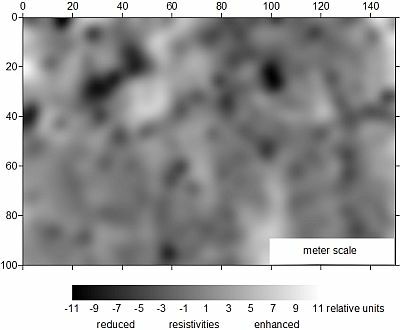 Geophysical measurements play an important role in the research on meteorite craters (impact structures). The unusual pressures, temperatures and mass movements closely related to meteorite impact result in partly drastic changes of the physical properties of the target rocks. These changes correspond to characteristic geophysical anomalies, and many a crater buried deeply in the Earth’s crust have first been discovered by geophysical soundings. In an earlier geophysical gravity survey at Lake Tüttensee, a peculiar ring of positive gravity anomalies was measured to have possibly resulted from a shock densification [article]. Now, we conducted a new campaign of geophysical measurements in the zone of impact ejecta that have been encountered in more than 30 excavation pits around Lake Tüttensee. Fig. 1. Klaus Ebinger (to the left), owner of the EBINGER company, during the Tüttensee crater geophysical campaign. Fig. 2. 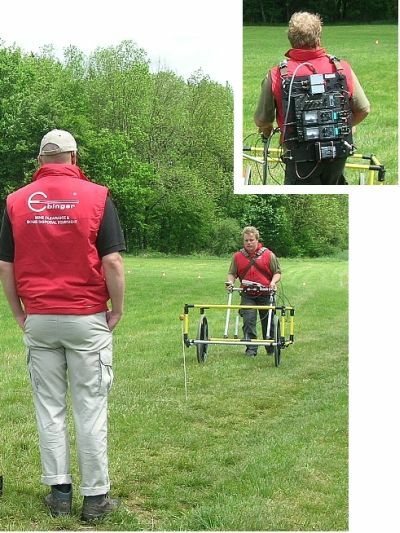 Pulse electromagnetic (TEM) survey at Lake Tüttensee using the EBINGER UPEX 740 M Large Twin Loop equipment. The geophysical survey comprised pulse (TEM) and frequency (FEM) electromagnetic soundings, and the primary objective was an area-wide investigation of the impact-related geological underground und its peculiarities so far only known from selective excavations around Lake Tüttensee. The campaign was generously supported by the EBINGER company (Cologne) [Ebinger Prüf- und Ortungstechnik GmbH], a worldwide operating producer of high-tech search and detection equipment (Fig. 1). The EBINGER products are applied to various fields like unexploded ordnance (UXO) disposal both by sea and by land, safety engineering, environmental geophysics, industry and research, and in this particular case the EBINGER company in a three-day campaign (Fig. 2) supported at no charge the research of the Chiemgau Impact Research Team (CIRT). From that campaign, Fig. 3 shows an example of processed pulse-electromagnetic (TEM) data sampled on an area of 150 x 100 m². The map exhibits conspicuous resistivity contours that, however, need further interpretation. Fig. 3. Pulse-electromagnetic (TEM) resistivity mapping at Lake Tüttensee crater using EBINGER Large Loop equipment.